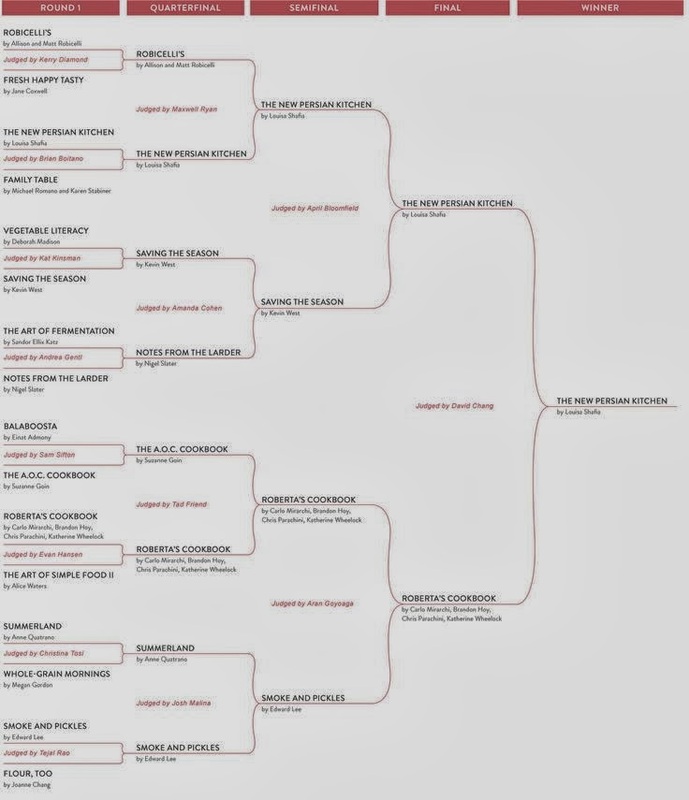 Since March Madness is coming up, I thought we'd talk about "The Piglet" Tournament of Cookbooks for 2014 - this is the kind of bracket I can actually get excited about. The 16 chosen cookbooks have been narrowed down to 1 winner, but obviously all of them are fantastic and would make a great hostess gift. Or a treat for yourself if you're in a cooking rut and are looking for some inspiration. Head over to Food52 to see the full list and meet the judges. With spring coming, this feels like a great time to set some new food resolutions. And I don't mean the "I'm going to cut out sugar / cheese / gluten" kind of resolution. But the kind where you decide to learn a new kitchen skill or add some new recipes to your repertoire - whatever you need to do to refresh your relationship with food. Here are my 3 choices from the tournament that I'm going to try out this year. I'd love to hear yours! Fresh Happy Tasty: "Diane von Furstenberg’s personal chef, Jane Coxwell, shares 100 healthy, delicious, and unpretentious recipes from her travels around the world on the Eos yacht." Recipes good enough for DVF are good enough for me. I especially love that they're simple enough to prepare in a small kitchen - this means they'll be perfect for making in the summer when we're in a rush to get outside and enjoy our terrace (which is currently still covered in ice). Family Table: "Family Table takes you behind the scenes of [Danny Meyer's] restaurants to share the food that the chefs make for one another before they cook for you." One of my favorite parts about the time I spent working in a fine dining kitchen was the family meal. The cooks loved the freedom of being able to experiment and the challenge of creating something out of whatever ingredients there was a surplus of. Though not as refined, some of these meals had more heart than the perfectly designed plates going out to guests in the dining room. Saving the Season: "With the present obsession among consumers for locally grown fruits and vegetables, the practice of putting up foods has undergone a renaissance. As West points out, the real goal of home canning, pickling, and preserving is to retain for future enjoyment the special flavors of foods freshly plucked from the earth or snatched from trees and vines." With the exception of a quick lesson in pickling at Haven's Kitchen last year, preserving is something I haven't yet learned how to do. My mother is great at this and sends me jars of vegetables from her garden each year, so I've let her handle preserving while I've stuck to what I'm good at (baking). But I feel like it's time to grow up and figure this one out for myself.